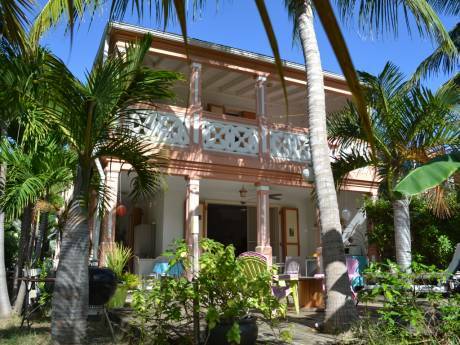 Our villa sits on an acre of land in Baie Rouge on the French side overlooking the Caribbean Sea and a lagoon. In the main house there are two bedrooms and two full baths. The house is very open with 4 large sliding doors open to the outdoors. From early in the morning until late at night, we keep the house wide open. Although there is air conditioning, we seldom use it because there is always a breeze from the sea that flows through the house. About 100 yards from the main house is a cottage that is a studio with a full kitchen and full bathroom and a 4 poster bed. When we arrive and open the doors, we feel immediately relaxed! We are Lyndy and Charlie. Lyndy is retired and enjoys doing volunteer work at the San Jose Museum of Art. She owned an art and independent movie theatre for 20 years. Charlie works in higher education administration at a bay area university. We love to travel and take every opportunity to discover new places. 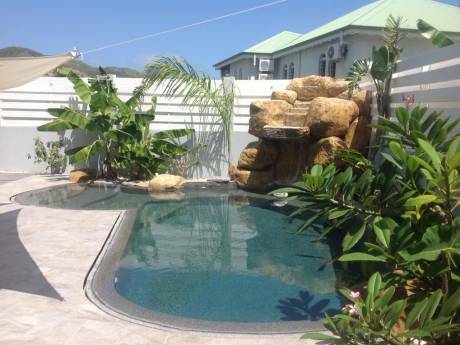 For the next year we will not be able to travel to our villa in St. Martin so we are interested in swapping a house with someone in the mid to south SF bay area for a year. We have never swapped before and are excited to see if living in the Caribbean is interesting to anyone out there. 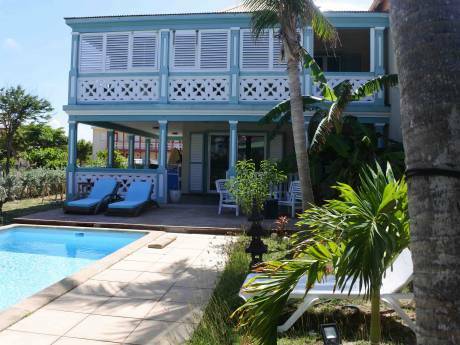 We are a 3 minute walk to Baie Rouge beach, one of the prettiest beaches on St. Martin. Our unobstructed view from our pool deck is approximately 160 degrees. With all houses on one or two acre lots, there is a lot of privacy. Our favorite activity is to sit by the pool with a glass of French vine (which is plentiful and resonably priced) and pick out formations in the clouds or gaze toward the sea and remember a wonderful day in the Caribbean.